Exeter’s legal community gathered in Southernhay yesterday, for a charity cheque presentation. The legal community has raised over £2,500 for the creation of a permanent cultural tribute to the buildings that perished in last year’s Cathedral Yard fire. David Charlesworth, partner and head of farms & estates, was featured in the Southernhay Life Painting. The painting depicts a ‘day in the life’ of the Southernhay area and shows lawyers and members of staff from Southernhay’s law firms. 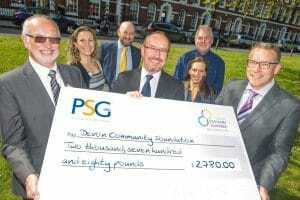 Photo caption: (L-R) Martin Gill (PSG), Catherine Mathews (Stephens Scown), Tony Steiner (Devon and Somerset Law Society), Andy Towers (PSG), David Charlesworth (WBW Solicitors), Jo Pruden (Browne Jacobson) and Scott Walker (Devon Community Foundation).